Becoming Bridal: A Timeline of Recommendations to have You Ready for Your Wedding Day. Congratulations on your engagement and upcoming wedding ceremony! This is a special time of preparation full of joy, dreaming, decisions, and planning. 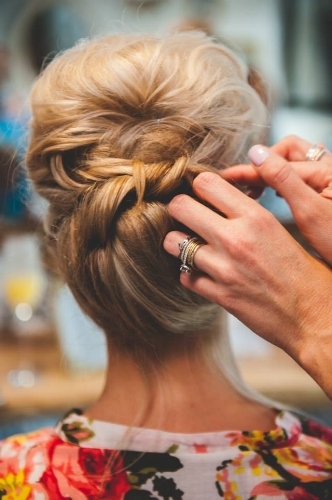 You probably have a whole Pinterest board with ideas for your hair and makeup! We would like to help you with some of the details you may not be thinking of with this suggested timeline to help keep you on track. Tap on the blog title above to read on! After you choose your dress and overall wedding theme, research styles of hair and makeup you would like for your wedding day. Start talking about your look with your stylist or researching to find a stylist if you don’t already have one. Your stylist will be able to make recommendations about what you will need to be thinking about to achieve your desired look. Increase your daily water intake. Incorporating exercise will not only have you looking your best, but will also boost serotonin and help you cope with planning stressors. Do you take vitamins? If not, now is the time to start! We recommend taking a multivitamin, biotin, Skin Omegas and Skin Complete by Jane Iredale. Start teeth whitening now if needed. Is your desired wedding day hair color lighter or darker than it is currently? Now is the time to start working that direction! Socap keratin bonded or Hot Heads tape-in extensions are our more permanent methods of all natural hair that will last you 4-6 months and cost anywhere from $300-$1500. We also have more temporary options for daily wear with Socap clip-in extensions and Hot Heads The Band, both custom ordered to match your hair color and desired length. These styles range from $350-$600, and include tips for how you can put them in. Looking for a way to just boost your own hair growth? Davines Energizing and Regenesis products stimulate your scalp and aid in growth. Talk to your stylist about what is best for you! Need to get your hair in better condition? Time to invest in conditioning treatments and salon quality products for optimum health and shine. Davines NaturalTech products have a treatment line for every hair and scalp ailment. Start by getting a facial and talk to your esthetician about a home skin care regimen with professional facials every 4-6 weeks. Our brand, Comfort Zone, has a line for every skin type all with anti-aging results. Let’s talk eyelashes. Every woman wants longer, fuller eyelashes on her wedding day. 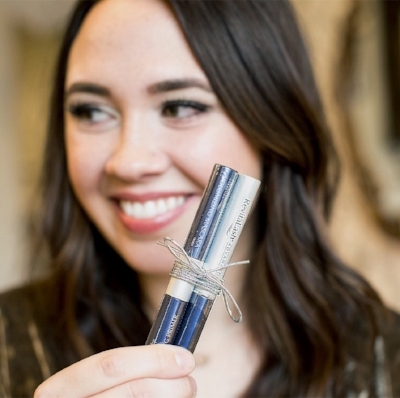 Decide if you would like to have eyelash extensions, use a lash growth serum like RevitaLash, or just wear an eyelash strip during your engagement and wedding festivities. RevitaLash Advanced Serum is $150 and lasts for approx 6 months! You will start to see longer, fuller lashes within 6-8 weeks. We recommend Xtreme Lash Extensions (available at Crown) if you are looking to wear individual extensions. A full set is $250 and you will need to get them filled ($1 per minute, usually $40-60) every 2-3 weeks. Never underestimate the power of properly shaped, full eyebrows. If your brows have been over tweezed or waxed, there is hope! RevitaBrow Advanced Serum ($150) will have new brow hairs growing back in within 8 weeks. We recommend putting your brows in rehab and not touching them at all during this time. No tweezing or waxing! After 8 weeks, come in and see one of our brow artists so they can give you the perfect shape! Then maintain your look with a brow appointment every 4-6 weeks with no at-home tweezing! Body and bikini waxing. Now is the time to start a regular regimen of 4-6 weeks, if you do not regularly do them. Waxing those areas becomes less painful and irritating each time you do them, plus you need to know now if your skin will have adverse reactions. You would hate to get your first bikini wax the week of your wedding and be uncomfortable on your honeymoon! Day of waxing tip: take some pain relievers about 30 minutes before your appointment. Schedule a trial run for your hair and makeup. Trials are highly recommended to ensure the perfect interpretation of your desired wedding day look. Do not flat iron your hair before a trial run, especially if your goal is loose, soft curls. Let the stylist know about any hair accessories, veils, or considerations that you plan to have. Take pictures you can save to look at on the wedding day. Finalize needed services for you and your wedding party so appropriate time and number of stylists can be scheduled on your wedding day. 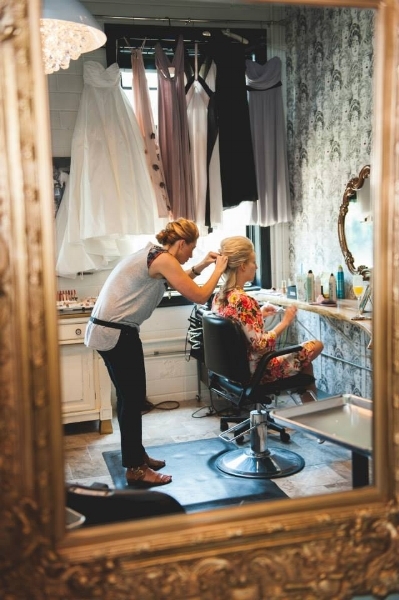 Will you be doing services at the salon or on-location? Keep in mind a stylist can always go onsite for a travel fee! Wearing hair extensions for the wedding day? We recommend wearing them for at least a month before so you have time to adjust to your new hair. Our hair extensions last 4-5 months so you could also get them to wear throughout your entire engagement, and replace them with a new set 1 month before the wedding day. Do not make any changes to your birth control, skincare program, laundry detergent, etc. because you do not know how your skin will react! 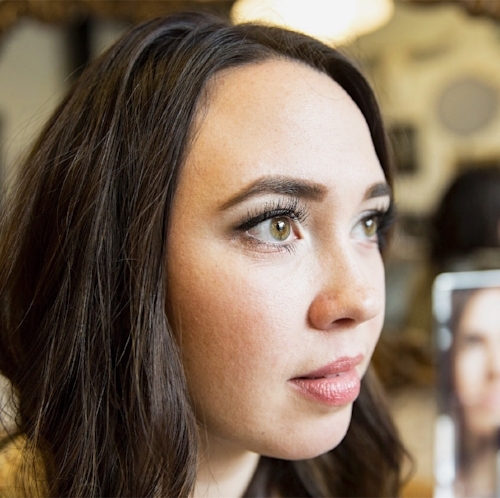 Keep maintaining your facial, brow, and lash regimen! Try out spray tanning now if you plan to get one before the wedding so you can make sure you like the color and see how long it lasts on your skin. Our Norvell airbrush spray tan lasts 5-7 days depending on each person’s skin moisturization and the use of the recommended products. Always come in with clean, exfoliated skin for your spray tan. Avoid using lotion before your appointment, and shave your legs for better even application. Be prepared to wait at least 8, but recommended 12 hours to shower. The tanning solution will darker over time so don’t be alarmed when you look in the mirror later! Ensure your spray tan lasts as long as possible by keeping your skin hydrated and moisturized after your initial shower. Get your facial, massage, body waxing, lash fill, and brow shape early in the week to induce some relaxation before your guests start to get in town. This will allow time to remedy anything necessary and heal any minor irritation. Schedule your hair appointment 3-5 days before the wedding day. It takes 72 hours for the cuticle to close after color and it looks best after day 3! This will also allow time to adjust anything to your color or cut if needed. Plan ahead and talk with your bridal party to see if you are doing nails together or before the group is together for the wedding weekend. We recommend a spray tan 2 days before your big weekend. Exfoliate and come in with clean skin free of all moisturizers and loose fitting clothing. Allow the tan to develop for 7-24 hours and then shower with recommended pH balanced soap. Moisturize your skin regularly to maintain your tan and for even exfoliation to avoid patchy spots as it fades. Avoid high sodium foods and drinks! Sodium holds 50 times its weight in water so you could shed an extra couple pounds of water weight. Get plenty of sleep the night before and drink lots of water! Don’t forget to eat something with protein that won’t cause bloating. Don’t be afraid to speak up if there is anything you want to adjust with your hair and makeup. It can always be taken down or wiped off and this is YOUR special day!!! And lastly, HAVE FUN! Enjoy this day and the people you share it with.